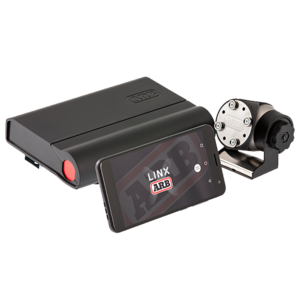 The ARB LINX Vehicle Accessory Interface is a unique modern controller that declutters the dashboard from classic switches, gauges and monitors and centralises the command of vehicle accessories with one sleek and smart driver interface. Built on an expandable platform, LINX integrates seamlessly with your 4WD and will continue to evolve your on and off road driving experience both now and into the future. Split screen view with another functionality displayed. Full screen by tapping the screen twice. Each accessory can be personalized and named. Each accessory can be automatically triggered by either ignition, low beam, high beam, reverse selection or none. Each accessory can be set for Low Battery Protection. LINX vehicle accessory interface is supplied with 6 pre-installed modules: front and rear traction, compressor control, accessory switchboard, battery monitor and air suspension control. LINX comes supplied with two main components, the touchscreen display and the main control unit. The main control unit and the supplied wiring looms conveniently lies out-of-sight underneath the vehicle’s dash or seat while the touchscreen display is affixed by bolting the supplied gimbal mount to the vehicle’s dash remaining within reach for the driver.